This work has processed, analyzed and regulated the data comprising surface temperature, sunshine duration and global solar radiation for the period of 1993 to 2007 in Van (38.28oN, 43.20oE). Hourly, monthly and annual variations of solar radiation are calculated. Furthermore, the annual variations of sunshine duration, surface temperature and clearness index are also analyzed. Annual average maximum global solar radiation was seen in 2000 with 19.68 MJ/m2day and the trend of yearly series of global solar radiation increases from 1993 to 2007. The highest hourly and monthly values are 3260 kJ/m2h and 28.72 MJ/m2day, respectively. Besides, daily monthly and annual of clearness index, hourly frequency distribution and sunshine duration are discussed and the solar radiation and the annual clearness index are correlated. Consequently, the Van region has a high solar energy potential and a high frequency of clear daylight. 1. Diaz, P, Peña, R. Muñoz, J, Arias, C.A, Sandoval, D, Field analysis of solar PV based collective systems for rural electrification, Energy, 2011, 36, 2509-2516. 2. Benghanem, M, Daffallah, K.O, Alamri, S.N, Joraid, A.A, Effect of pumping head on solar water pumping system, Energy Conversion and Management, 2014, 77, 334-339. 3. Helwa, N.H, Abdel Rehime, Z.S, Experimental study of the performance of solar dryers with pebble beds, Energy Sources, 2007, 19 (6), 579-591. 4. Chaturvedi, S.K, Gagrani, V.D, Abdel Salam, T.M, Solar-assisted heat pump - A sustainable system for low-temperature water heating applications,, Energy Conversion and Management, 2014, 77, 550-557. 5. Ayompe, L.M, Duffy, A, Analysis of the thermal performance of a solar water heating system with flat plate collectors in a temperate climate, Applied Thermal Engineering, 2013, 58:447-454. 6. Soussib, M, Balghouthia, M, Guizania, A, Energy performance analysis of a solar-cooled building in Tunisia: Passive strategies impact and improvement techniques, Energy and Building 2013, 67, 374-386. 7. Şenkal, O, Şahin, M. Peştemalci, V, The Estimation of solar radiation for different time periods, Energy Sources, Part A: Recovery Utilization and Environmental Effects, 2010, 32(13), 1176-1184. 8. Mohandes, M, Rehman, S, Halawani, T.O, Estimation of global solar radiation using artificial neural networks, Renewable Energy, 1998,14,179-184. 9. Sözen, A, Arcaklioğlu, E, Özalp, M, Estimation of solar potential in Turkey by artificial neural network s using meteorological and geographical data, Energy Conversion and Management, 2004, 45, 3033-3052. 10. Azeez, M.A, Artificial neural network estimation of global solar radiation using meteorological parameters in Gusau, Nigeria, Archives of Applied Science Research, 2011, 3(2), 586-595. 11. Hasni, A, Sehli, A, Draoui, B, Bassou, A, and Amieur, B, Estimating global solar radiation using artificial neural network and climate data in the south-western region of Algeria, Energy Procedia, 2012, 18, 531–537. 12. Hirunlabh, J, Sarachitti, R, Namprakai, P, Estimating solar radiation at the earth’s surface from satellite data, Tammasart International Journal of Science and Technology, 1997, 1,69-79. 13. Janjai, S, Laksanaboonsong, J, Nunez, M, Thongsathitya, A, Development of a method for generating operational solar radiation maps from satellite data for a tropical environment, Solar Energy, 2005, 78,739-751. 14. Vignola, F, Harlan, P, Perez, R, Kmiecik, M, Analysis of satellite derived beam and global solar radiation data, Solar Energy, 2007, 81, 768-772. 15. Bakirci, K, Correlations for estimation of daily global solar radiation with hours of bright sunshine in Turkey, Energy, 2009, 34, 485-501. 16. Toğrul, I.T, Onat, E, A study for estimating solar radiation in Elaziğ using geographical and meteorological data, Energy Conversion and Management, 1999, 40, 1577-1584. 17. Bulut, H, Büyükalaca, O, Simple model for the generation of daily global solar-radiation data in Turkey, Applied Energy, 2007, 84, 477-491. 18. Duffie, J.A, Beckman, W.A, Solar Engineering of Thermal Processes 3rd. ed, John Willey & Sons, New York, 1991. 19. 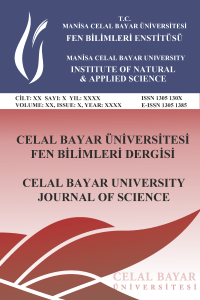 Aksoy, B, Solar radiation over Turkey and its analysis, International Journal of Remote Sensing, 2011, 32, 6261-6272. 20. Esen, H, Experimental energy and energy analysis of a double-flow solar air heater having different obstacles on absorber plates, Building and Environment, 2008, 43, 1046-1054.